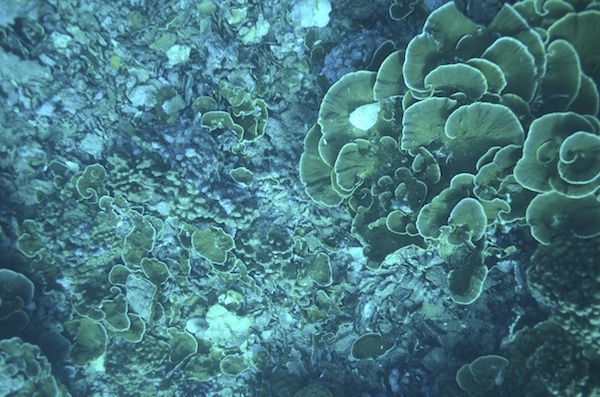 Mapping coral reefs for science is now easier than ever! 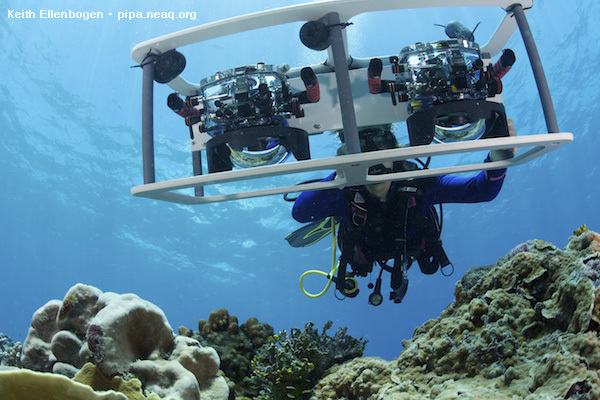 Using exciting new technology developed by a team at The University of Miami, Kathyrn Furby (a PhD student at Scripps Institution of Oceanography) launches a dual camera system (nicknamed “PHOTOMEGATRON”) onto the coral reefs of the Phoenix Islands. This work is a new collaborative effort between The University of Miami and Scripps Institution of Oceanography. 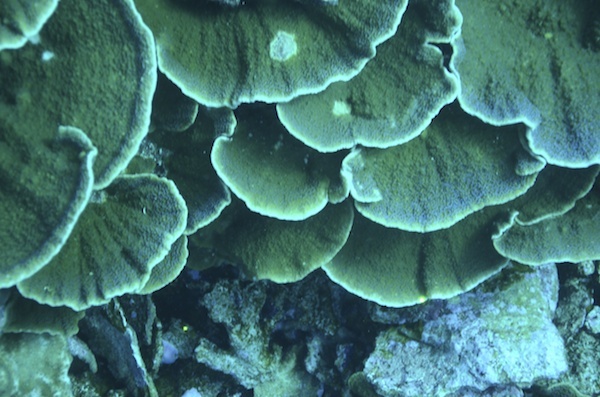 The goals of the project are to document spatiotemporal changes of coral reef benthic environments across multiple reef systems, islands and archipelagoes across the Pacific Ocean by creating large photo mosaics of the reef floor through time. For more information on the benthic mosaicing technology visit this page. Kathryn Furby shares her experience below. Kathryn Furby swims the PHOTOMEGATRON above a coral reef in the Phoenix Islands. Meet PHOTOMEGATRON (imagine James Earl Jones in his low voice saying the word photomegatron). A tandem camera setup, it takes photos (one per second) while I swim it above the reef. How do you build your own Transformer to map reefs for you? Take two Nikon SLR’s, mount them in a protective frame and add lasers. The lasers are used to calibrate the scale of the photos, although I use them to look fierce (incidentally, watching damselfish chase the lasers is my new favorite game). After thousands of photos are taken over a large area, we send them to our collaborators at the University of Miami. They use their custom algorithm that compiles the overlapping photos into a large “mosaic” of the reef. The finished product is an approximately 60 – 100 square meter map of a coral reef, with a 5mm resolution. Ecology is largely an observational science. One that is constantly evolving. Previous to the mosaic method, we would mark a specific location on the coral reef and photograph it. Each photo covered no more than one square meter per quadrat. With this we could revisit the sites again and again, take the same photo at the same marked location, and thus track corals’ changes in health or size over time. However, a disadvantage to this is that you miss out on massive corals. One square meter doesn’t cover too many small corals, and it completely excludes the big ones. Large boulder corals or giant branching plate corals are the charismatic mega-fauna of the benthic environment. The adorable manatees of the invertebrate world. These corals live for hundreds of years, and until now we haven’t had a good way to study them. We’ve personally tagged individuals, but this is time-consuming. It can be difficult to cover a representative sample. Now with PHOTOMEGATRON (enter James Earl Jones again) we can digitally tag the corals. We photograph a large swath of reef, return to marked sites year after year. This way we can track the fates of corals, large and small. The Sandin Lab at Scripps Institution of Oceanography is using this method here at the Phoenix Islands this month, Palmyra Atoll at the end of the summer, and after that … who knows. PHOTOMEGATRON is locked and loaded, ready to map and monitor the reefs of the world! If you have two cameras, why do you need lasers to calculate scale? You can get scale directly from the stereo pair. The two cameras are not acting in stereo. One camera is set to a wide-angle (18mm) and the other to a closer zoom (55mm). The 18mm provides a wide field of view and acts as the base map for the mosaic algorithm. The higher resolution images can then be stitched together using this base map as guidance. The two cameras have approx 90% overlap in their field of view. The lasers are mounted to the base of the camera set to the 55mm zoom and thus each close-up high res image has a set of laser points (approx 15cm apart) for calibration. Dr. Gleason and colleagues are the pioneers behind this technology and, fortunately for us coral reef ecologists, most of the hard work happens during the post-processing of the images in the lab. The example mosaic above is one Dr. Gleason and colleagues made.